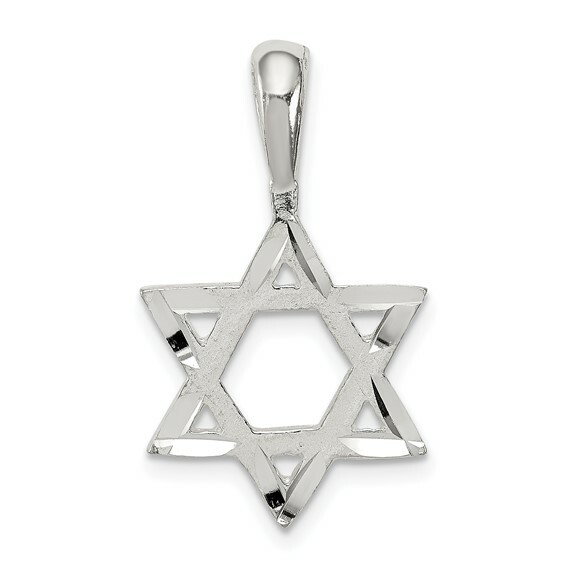 Diamond-cut star of David pendant is made of polished, solid sterling silver. Dimensions: 5/8 inch tall x 5/8 inch wide without bail. The bail dimensions are 3mm x 3mm. This item is smaller than a dime. The six-pointed star is the central symbol for Judaism. Weight: 1.37 grams. Made in USA. This was a Christmas gift, and the recipient was thrilled. I looked high and low for a product that was similar in the same price range, and couldn't find it. Shipping was Super Fast, and I couldn't be happier.